The G.C.E. Ordinary Level examination for year 2018 will commence today (03) and last until the 12th of December. The exam faced by 656,641 candidates this year will be held at 4,661 exam centers island-wide, stated the Department of Examinations. 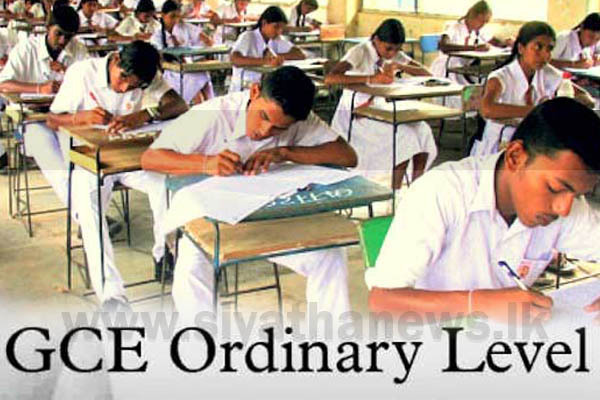 Special exam centers have been set up at Ratmalana, Tangalle, Matara, Chilaw and Magazine prisons for detainees who will facing the exam as well. According to the Department of Examination, 541 coordination centers too have been set up for this year’s exam. The Department of Examinations issued a series of guidelines for the candidates facing the examination. Accordingly, the candidates should be present at the examination hall at 8.00 am as the exam will be commencing at 8.30 am. Measures have been taken to inform all examiners to be on alert if any candidate is cheating with the use of smartwatches, mobile phones or any other electronic device. Candidates who are caught cheating in the exam will be banned from sitting for any exam held by the Department of Examinations for 05 years. The Examinations Department also noted that they have informed the examiners to immediately inform the Examination Department and the Police Headquarters if any obstacle is encountered by the applicants from external parties during the examination. Meanwhile, the Police Department has taken measures to provide special security for the conduct of the Ordinary Level examination commencing today. A police sergeant and two police constables will be deployed for each coordination center and a divisional assembly center, stated the Police Media Spokesperson.